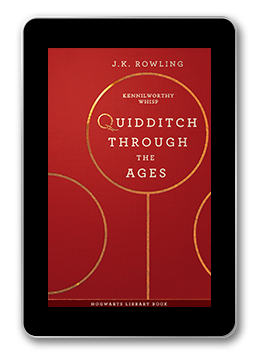 A perennial bestseller in the wizarding world and one of the most popular books in the Hogwarts School library, Quidditch Through the Ages contains all you will ever need to know about the history, the rules – and the breaking of the rules – of the noble sport of Quidditch. 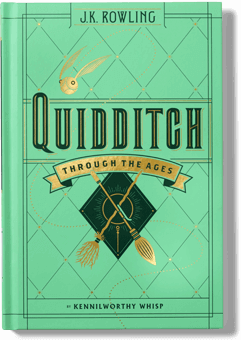 Packed with fascinating facts, this definitive guide by the esteemed Quidditch writer Kennilworthy Whisp charts the game’s history from its early origins in the medieval mists on Queerditch Marsh, through to the modern-day sport loved by so many wizard and Muggle families around the world. With comprehensive coverage of famous Quidditch teams, the commonest fouls, the development of racing brooms, and much, much more. 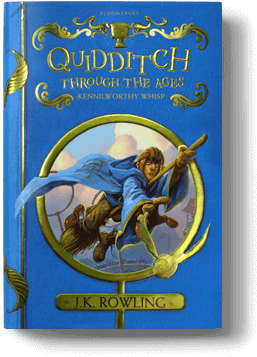 Quidditch Through The Ages first appeared as the title of one of Harry Potter’s school books within the novels. It was published by Bloomsbury Children’s Books and Scholastic along with Fantastic Beasts and Where to Find Them in March 2001 in aid of Comic Relief.